Our Active Communities efforts are making it easier to walk, bike and be active in Winnebago County. Through partnerships, we are creating more opportunities for people to be physically active, which can lead to improved health outcomes and reduced rates of chronic disease. The Winnebago County Health, Highway and Parks Departments recently completed the "Connecting People and Communities: Winnebago County Bicycle & Pedestrian Plan." The Plan focuses on creating opportunities for residents to use active transportation, connecting routes to destinations, and making our local roads safer for biking and walking. Implementation of The Plan will be overseen by a steering committee of County staff and other local stakeholders. 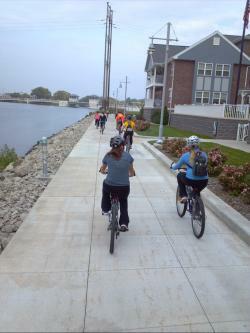 The Winnebago County Plan connects with the Appleton/Oshkosh urbanized area bicycle & pedestrian plan and other local municipal bicycle & pedestrian plans. WCHD provides a unique perspective on serveral planning committees connecting public health concerns to how our communities are designed and built. The Winnebago County Trails Map, put together by the Winnebago County Bike/Ped Stakeholder Team, shows paved and unpaved routes, trails and facilities along with important amenities and features like public restrooms, points of interest, pet friendly areas, and fix-it stations. When planners and public health professionals work together, great places to live, work, learn and play are designed and built. Local "health in planning" partners are educating elected officials and college students about how community conditions impact health and the benefits of including health concepts in local plans, decision-making processes and policies. 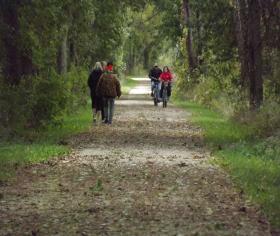 There are dozens of groups, events and programs in Winnebago County and the greater Fox Valley Region that are increasing visibility and demand for biking and walking. Some include the National Bike Challenge, Oshkosh Slow Roll, Cycling Without Age, Oshkosh Cycling Club, Fox Cities Cycling Association, the Neenah Summer Fun Runs and the Oshkosh Summer Fun Runs. Many others are listed on the Active Communities events page on the re:TH!NK website. The Health Department partners with East Central Wisconsin Regional Planning Commission, schools and law enforcement to promote the regional Safe Routes to School Program in all Winnebago County school districts. Documents on this site may require a PDF Reader, such as Adobe Reader.